Some time ago I looked at OCZ's Vendetta cooler and in this review I'm going to take a brief look at its new brother: the Vendetta 2. 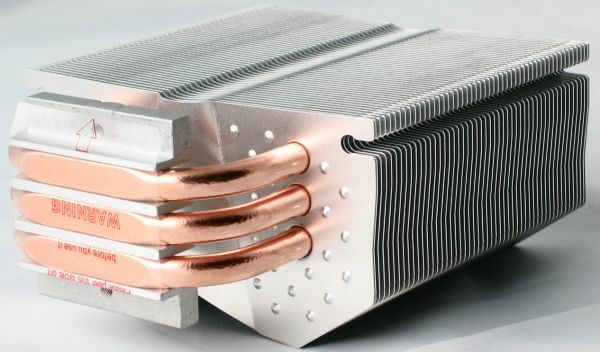 This new cooler looks a lot like it's older brother, but it has a bigger heatsink and uses a larger fan to deliver better cooling performance. The retail box is pictured below. 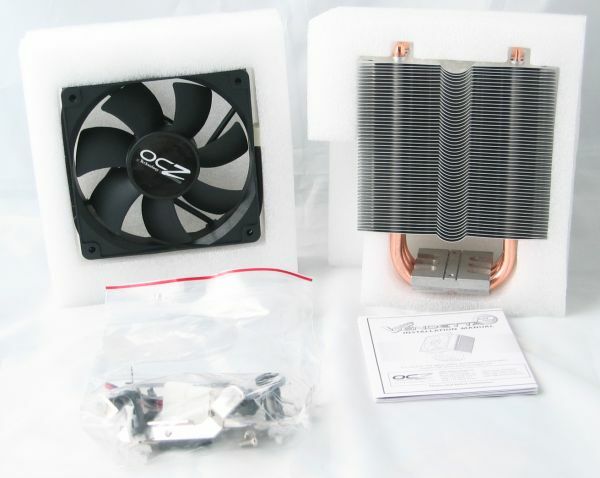 Inside you find the heatsink, the 120mm fan, the mounting material and a brief installation manual. 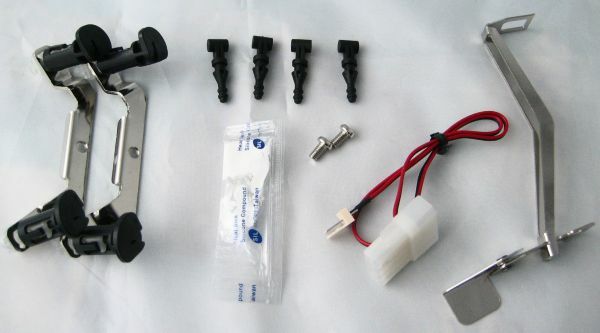 Mounting material is included for AMD 754/939/AM2 and Intel LGA775 processors, as well as rubber plugs for the fan, a bag of thermal compound and a 3-pin to 4-pin Molex converter for the fan. 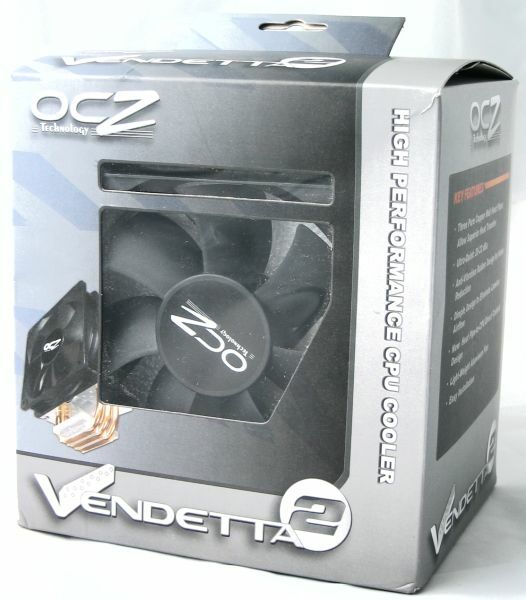 While the original Vendetta used a noisy 92mm fan the Vendetta 2 uses a 120mm fan. 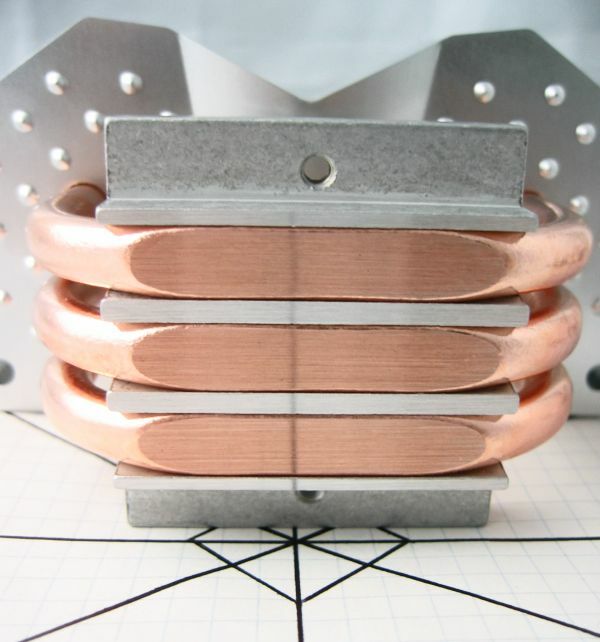 This PWM model delivers an airflow of 65-81CFM at a noise level of 20-32dBA. The fan features a 4-pin PWM connector, don't worry if your motherboard still has a 3-pin fan header because it's backwards compatible. 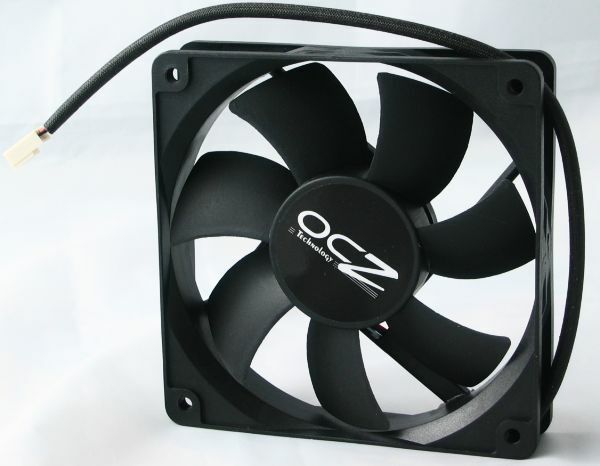 Alternatively, you can also use the converter cable to connect the fan directly to your power supply. 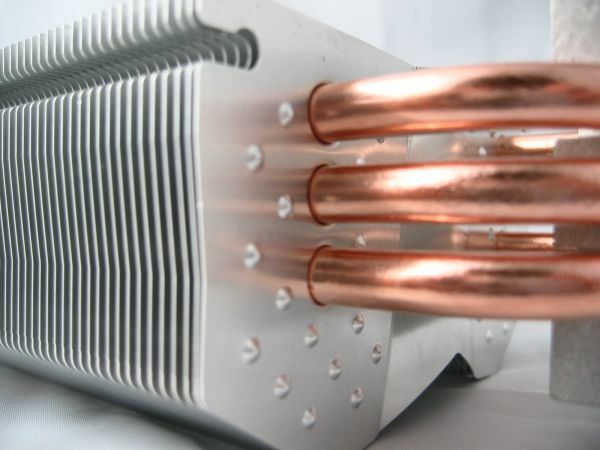 The Vendetta 2 heatsink features three direct-touch heatpipes and an aluminium fin array. 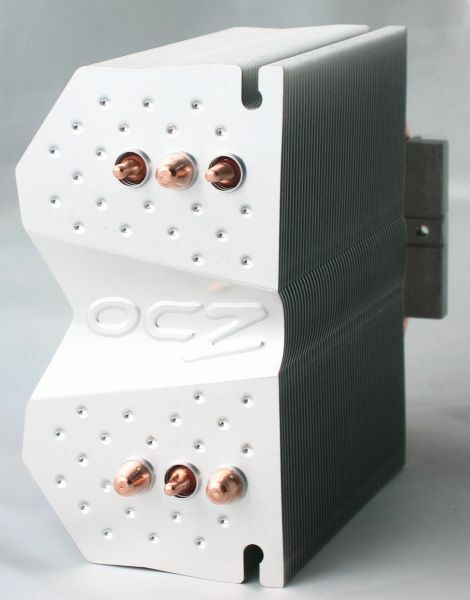 Just like on the original Vendetta, OCZ has employed a V-shaped design to increase the surface area of the heatsink as well as a dimple fin design to reduce laminar airflow effect. The base is protected by a peel-off sticker so it can't get dirty prior to installation. 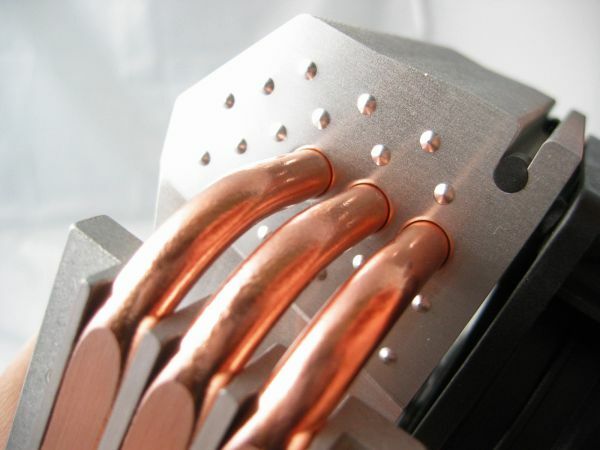 A closeup of the heatpipes and the dimples. 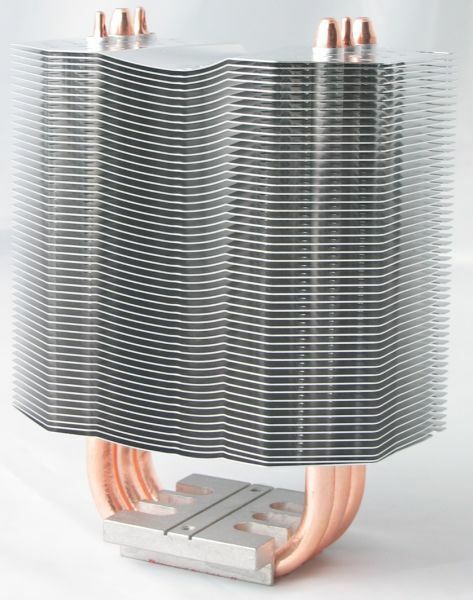 The base doesn't have a mirror-like finish, some lapping may increase the cooler's efficiency. 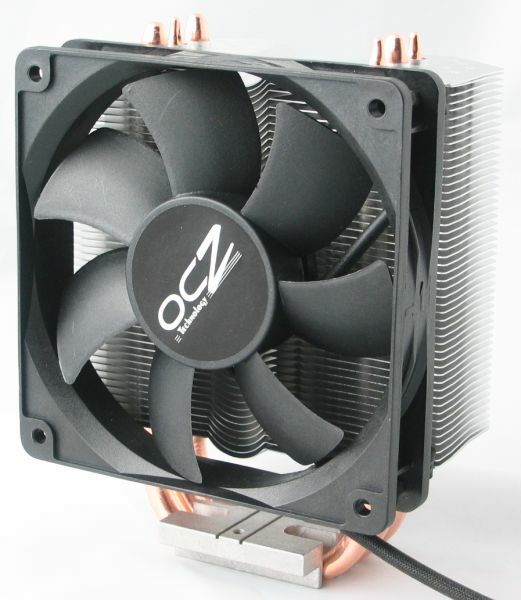 The fan is mounted to the heatsink with four rubber plugs, this reduces vibrational noise. The rubber plugs must be squeezed through the fan holes and are then slid over the fins of the heatsink. It's somewhat more convenient than most fan clip designs, but the downside is that you'll easily end up with a couple of bend fin tips if you're not careful enough. Unfortunately, there's no support for an additional fan. Before I head over to the performance tests, here's a look at the complete HSF.